The Pettersson Keys went out of production in 2007 and our last new key was sold in January, 2008. This web page is left in place for historical and reference purposes. This is the ORIGINAL SRS "Swedish Pump Key," often imitated but never duplicated. We thought it had gone out of production years ago, but were delighted to find that the maker, Lennart Pettersson, is still in business. 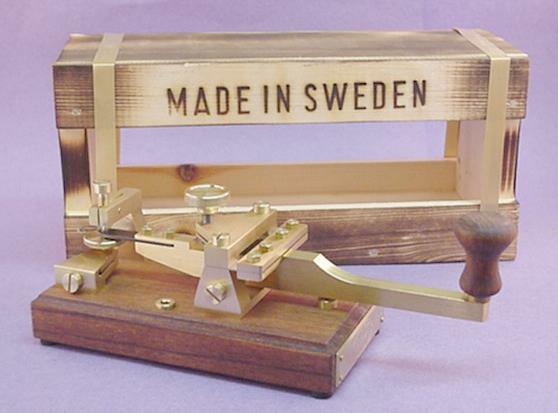 The Swedish key is a massive instrument, well suited to the European keying style but a delight for anyone to use. If you have ever used a "massy" key you will immediately recognize the smooth, "liquid" feel which results in almost effortless keying. Tension is provided by a single leaf or "torsion bar" spring at the front of the key, and controlled by the large round knob on the top. Contacts are at the rear of the key, and it is set up for either traditional "on-off" keying or "make-and-break" (in which the receiving circuit is opened when the transmitting circuit is keyed). The key is mounted on a nicely finished dark hardwood (mahogany?) base which conceals a heavy weight under a brass plate. The maker's logo and serial number are engraved on a plate at the front of the key. The base measures around 4" by 2" by 1-1/2" high. The overall length (from the rear of the base to the front of the knob) is 7-1/2" while the overall height (to the top of the adjusting knob) is 2-3/4." Total weight is 800g, or about an ounce under TWO POUNDS. 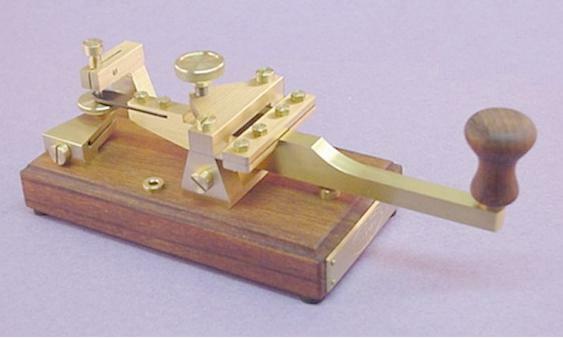 It's hard to say whether this one should be classed as a telegraph key, or as jewelry! A special miniaturized, yet functional version of the SRS-key is available in natural brass. The lever is textured (it appears to have been cast rather than machined from flat stock) and the inside of the trunnion support is engine-turned. The base and knob are made of teak - painted black, giving it a very high-tech look. The long lever gives the key a distinctive and very precise feel, most unusual in a miniature key -- the precision brasswork is responsible for a large part of the price! 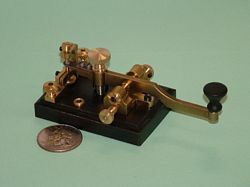 The adjustments are high-precision, and the contacts are at the rear (connection via the two miniature brass binding posts). It's a treasure to look at and a delight to use! The key is shipped in a wooden box.with green felt lining and hinged lid. The Mini Swedish measures 5-1/4" long (to end of knob) by 3-1/4" wide by 2-1/2 inches high (compare to the quarter in the photo) and weighs 93g or around 3.3 Oz.